In only its second season of existence, the Major League Soccer team in Atlanta sold more than 1 million total tickets this year. Atlanta United FC, which shares Mercedes-Benz Stadium with the Atlanta Falcons, set a single-season MLS attendance record last year of 48,200 attendees per game on average. This year, the team’s attendance rose to an average 55,000 fans per game and had eight games that topped 70,000 fans. Apart from NFL teams, Atlanta United had the highest average attendance of any U.S. pro sports team. Its attendance puts it in the top 15 most-attended pro sports teams in the world, bigger than Manchester City or Paris Saint-Germain. The team also hosted this year’s MLS Cup in its own stadium—and won. It was a banner year for soccer in Atlanta. But the story with MLS in 2018 is much bigger than Atlanta. MLS is certainly still a distant cousin to America’s “Big Four” pro sports leagues (NFL, MLB, NBA and NHL) by revenue and eyeballs, but it is no longer “small” by any definition. This year, the league’s total attendance was 9.05 million, up from 8.72 million the year before; the league’s average ticket revenue per game rose by 10% over last year to its highest level in the league’s 23-season history; and viewership for the MLS Cup on Fox was up 71% over the year before to its highest rating since 1997. All of the momentum makes MLS our 2018 Sports Business of the Year. It’s a title we gave to Fanatics last year, and Adidas in 2016. Read on for more about how MLS is finally catching on with mainstream American sports fans. Just 10 years ago, Major League Soccer had 14 teams. Next season it will have 24, with Cincinnati debuting. New teams in Nashville (2020), Miami (2020), and Austin (2021) are all confirmed. The league will name its 28th club next year. LAFC, the new team in Los Angeles that debuted this season with a star-studded ownership group that includes Will Ferrell, Magic Johnson, Mia Hamm and Nomar Garciaparra, sold out every game at the new Banc of California Stadium. 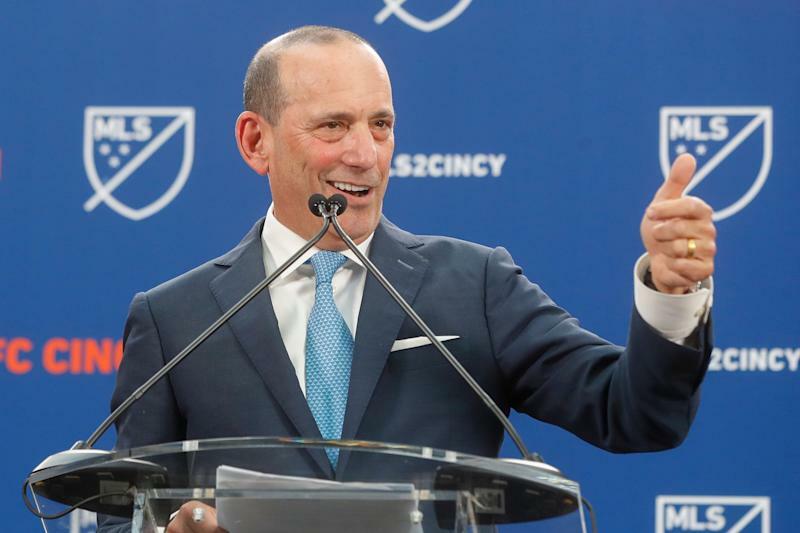 MLS Commissioner Don Garber in Cincinnati, May 2018. (AP Photo, John Minchillo). MLS is expanding voraciously, and each new expansion team pays a $150 million expansion fee. Forbes estimates that the average team is worth $240 million, up nearly 8% over last year. (MLS does not share its revenue figures.) And thanks to the expansion fees, the value of Soccer United Marketing, the commercial arm of MLS, has soared. Forbes reports that when MLS owners bought back Providence Equity Partners’ 20% stake in SUM, it valued SUM at $2 billion. Attention for the 2018 MLS Cup, the league’s championship game, is perhaps the strongest evidence of a rise in popularity this year. The game drew a record in-person crowd of 73,019 and record TV viewership of 1.56 million viewers on Fox, peaking at 2.06 million viewers. Atlanta United is the shining example. “When I came to Atlanta, the only negative I heard was that it wasn’t a sports city,” Atlanta United president Darren Eales said on Yahoo Finance’s Morning Meeting show this month. “I think what we were able to do was make Atlanta United the team for Atlanta. So if you’re a transplant from someone else, like you’re from Philadelphia and you’re an Eagles fan, you’re an Atlanta United soccer team because people haven’t built those allegiances up.” Garber compares the club to a growth stock. The league also announced this month a new playoff format, starting next season, that is a very welcome change for mainstream American sports fans: MLS will shift to a bracket-style, single-elimination playoff structure, rather than its prior complicated system involving total points. Changing the playoff structure required extensive conversations with the league’s TV sponsors, but those sponsors are likely happier with single-elimination because it tends to have more urgency and excitement. And MLS helped save the Crew. 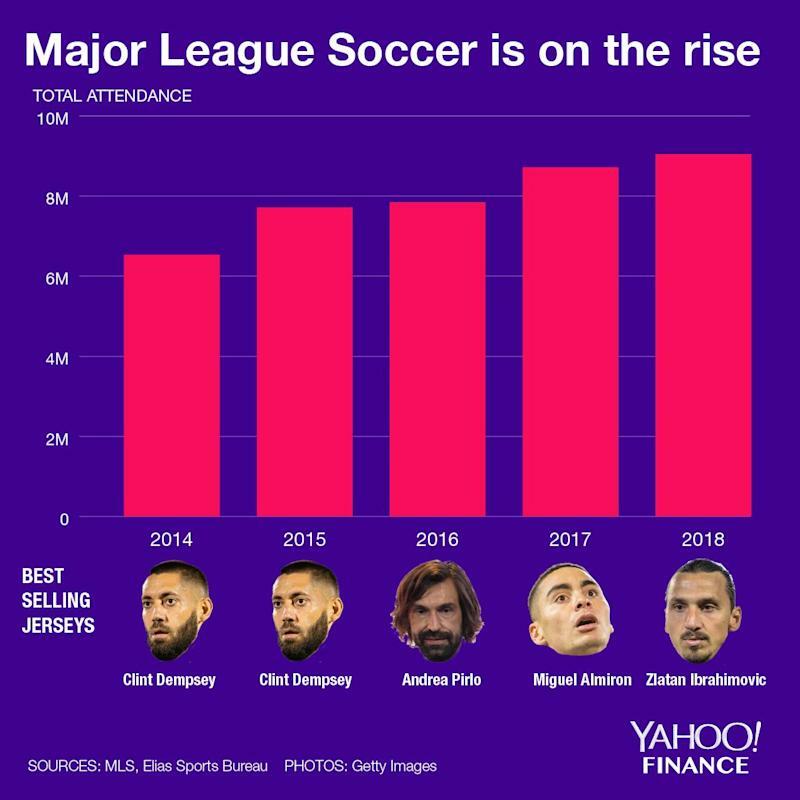 Just over one year ago, in October 2017, Garber appeared at the Yahoo Finance All Markets Summit in New York at a time when the hot-button issue in soccer was the Columbus Crew, of Columbus, Ohio, looking all but certain to relocate to Austin, Texas. It’s what owner Anthony Precourt reportedly wanted. Crew fans had already been revolting on Twitter under the hashtag #SaveTheCrew. On stage last year, Garber told Yahoo Finance the Columbus team “is evaluating what their options are to determine whether or not it makes sense to move to Austin... no decision has been made to move to Austin… No league, and certainly no leader of a league, wants to move a club.” Many Columbus fans dismissed those comments on Twitter, believing it was already a done deal that the team would ditch Columbus. Instead, there is a deal in the works for the Haslam family, owners of the Cleveland Browns, to buy the Crew and keep the team in Columbus; Crew owner Precourt will get his wish of a new stadium in Austin, which is getting an expansion team. I want to thank the #savethecrew grassroots movement leaders for spearheading the campaign that helped to keep my beloved Crew in Cbus that I have been following since I was a junior at tOSU in 96. And to all the city leaders that helped to make this come to fruition. Thank you! Of course, most American sports fans have zero interest in watching MLS. It is not yet at a “must watch” level for them, but it’s getting there. With its incredible growth, the league is beginning to convert skeptics. And in 2026, the World Cup is coming to North America with the U.S., Canada, and Mexico as the hosts. The timing will be perfect: it will be the 30th anniversary of MLS. As the league grows, it is gradually flipping the narrative that soccer fans in the U.S. only follow European soccer, and don’t care about U.S. soccer except for the national team during World Cup years. MLS is stoking soccer love in the States.